Hi guys, today I bring you my very first sushi recipe! A Homemade Maki Sushi recipe to be exact. Recently I learned how to do it & I wish to share it with you because its amazing! Pot, knife, cutting board, bamboo mat, cling film, small bowls, bowl with cold water. Rice – Cook for 15min, cover it with a lid & let it rest for 5min. Allow it to cool (30min). While the rice is cooking, let’s prepare all the fillings. Wash cucumber, cut into even sticks (skin on or off). Peel avocado & slice it up into even slices. Same with Salmon (skin off), cut into even long slices. Cover the bamboo mat into a cling film from both sides. Place a sheet of seaweed on the mat, there should be a rough side and a smooth side. Make sure that the rough side is facing up. Add approx 3 tbsp of rice on it (depends on the size of the Nori sheets & spoon). Carefully spread the rice over with your fingers, covering 3/4 of the sheet, nice & evenly. Sprinkle with the sesame seeds. Add fillings to the middle of the sheet. Next, carefully roll the sushi, giving the roll a gentle squeeze to compress the ingredients. Remove the bamboo mat & keep rolling. Use the bamboo mat to compress the roll again, squeezing gently. Doesn’t make sense? Check a video on the end of the post. To cut the rolls into rounds, you will need a very sharp knife. Make sure to clean the blade of the knife, in cold water, after every time you cut off a piece of sushi. Otherwise the blade will quickly become sticky making impossible to cut. Decorate with any fresh vegetable or herbs if you wish. 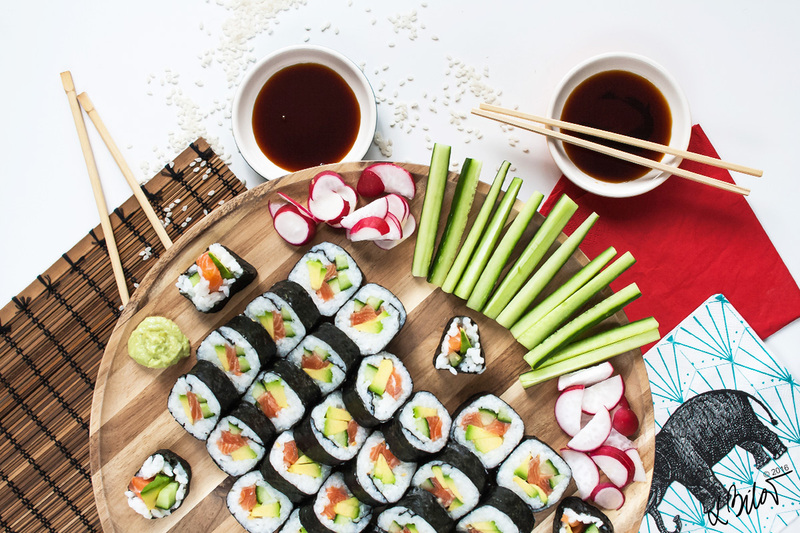 Voilà your first delicious Maki Sushi is ready to blow your taste away & amaze some friends :) Serve it with wasabi & soya sauce in small bowls. The longest part of this recipe is waiting for the rice to cool down. Otherwise it’s a surprisingly quick & easy meal. Not mentioning that its healthy & delicious. It will get quite sticky, so make sure that you have a small bowl of water ready, before you start “rolling” so that you can wash your fingers off when you need to! Also wash & clean your knife in a cold water. It began around the 8th century in Japan. The original type of sushi was first developed in Southeast Asia as a means of preserving fish in fermented rice. In the Muromachi period, people began to eat the rice as well as the fish. More on Wiki.